Who’s the real Villain of the Animal World? With “Jaws” making a comeback at my local cinema and all manner of critters doing their utmost to make life unpleasant for the “Men in Black 3”, it is not surprising my mind’s been focussing on the villains of the animal kingdom. Willow the Vampire lives in rural Stinkforthshire in England, where she does her best to protect her friends, family and local wildlife from those who’d like to harm them. When she’s not too busy, she likes to save the world. Willow loves animals, be they daytime or nocturnal creatures, but even a vampire might draw the line at choosing a cane toad for a friend. The villain of this blog post is not at all like the pet toad owned by Neville Longbottom in J K Rowling’s Harry Potter series, but is more like Ron Weasley’s rat in nature. Bufo marinos, as the cane toad is officially called, was once introduced into the sugarcane fields of Puerto Rico to exercise a little insect pest control. Sugarcane growers in Queensland, Australia heard about this and promptly wanted their own cane toad population to deal with their local insects. They imported 100 adult cane toads with the view to breed their own pest control army. Eventually, when they had bred 62,000 teenage cane toads, they released them to give hell to the grayback cane beetle that infested the sugarcane plantations (1935). Unfortunately, the pesky cane toad has no natural enemies other than humans in Queensland, so toad populations exploded and instead of dealing with grayback cane beetle infestations, the local human population was battling it out with very nasty toads which had plague-like proportions in their numbers. Cane toads being rather adaptable, they soon found that they could munch their way through anything that was smaller than themselves, even going into competition with the local dog population, pinching the dog food out of their bowls at night. So far nobody knows how to effectively deal with the cane toad invasion. Can toads have excellent defences. When they feel threatened, they inflate their plump bodies and start to sweat a latex-like, milky white fluid from their paratoid glands. They are able to project this secretion up to 3 feet into the air, hurling their poison at the perceived aggressor. The poison is only fatal when ingested and is so strong, it has been used as a hallucinogenic drug. The poison has already had a devastating effect on the snake population in Australia. While some people think this is a good thing (yes you, visitingmissoury, I know your thoughts on all things snaky! ), a dying snake population means all sorts of other pests will multiply more quickly, in turn provide even more food for the cane toad and PUFF, there you have it, Australia is now being ruled by cane toads instead of plain politicians (although the difference is not always apparent at first glance). Animals who might look upon the cane toad as a tasty snack soon regret their decision. At 2 pounds in weight the cane toad packs a poisonous punch when swallowed and birds, dingos, monitor lizards and similar predators have been known to die from the toxic liquid. 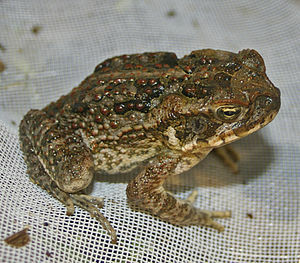 Equally, fish die from eating cane toad tadpoles, which are already able to secrete this toxic stuff upon their person. In South America, several Peruvian Indians are said to have died after eating a cane toad egg soup. Their mating calls are so loud that they interfere with the vocal love life of the indigenous frog population. As they grow up to 9 inches (23 cm) in size, cane toads can weigh up to 2 pounds and have even been known to swallow a pygmy possum or two for their supper. What’s your favourite villain of the animal world? I found all that very interesting. I didn’t realise that Australia was over run with toads. Poor Magsx2 losing a dog because of it. I don’t have an animal which I hate – I think it’s because I find them so interesting. I’ve learned over the years not to trust people who dislike animals (across the board). Sure, there’ll be people who are scared of dogs, because they once got bitten, or of horses, because they got thrown off, but then they didn’t understand how to deal with animals on their own terms – saying we hate or dislike animals is almost like saying we hate or dislike children and therefore the better part of us. There are animals that I’m less fond of (buzzing insects mainly, leeches and maggots), but just like you, I find animals endlessley fascinating. I think part of the problem is that certain folks expect animals to think like us, they don’t seem to realise that animals have different ways. Mildred says that one day we might learn how to behave properly. I do hope Mildred’s right, although most humans seem a lost cause. Mildred always right – or so she tells me. This one certainly does. She seems to have such a good time – most of the time. Oh yes I know all about the cane toad, they are everywhere in Queensland even in our capitol city of Brisbane where I live you will see cane toads especially if there is a creek near by. These awful animals have killed a lot of pets as well, I lost a dog when I was a child to the cane toad, their poison is toxic, the vet done his best, but she was only a small dog so we couldn’t save her. What a sad story. It’s terrible what human stupidity and the inability to look ahead and see the consequences of one’s actions can cause. Wicked animals I like? I would probably have to look at bats or rats. Aw, but bats are nice animals on the whole; just vampire bats would really qualify as baddies. Pet rats can be rather cute, but i must admit the ones living in our cities are very creepy.